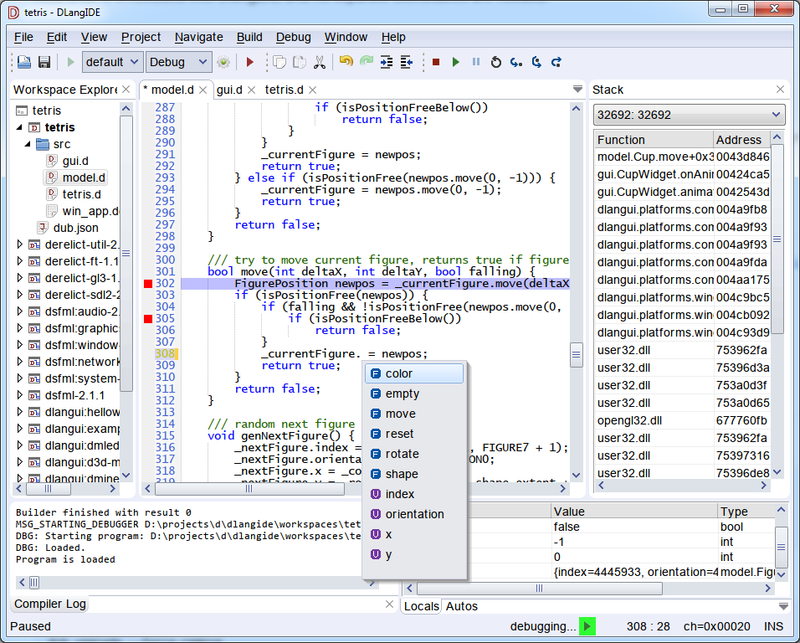 Cross platform D language IDE written using DlangUI library. 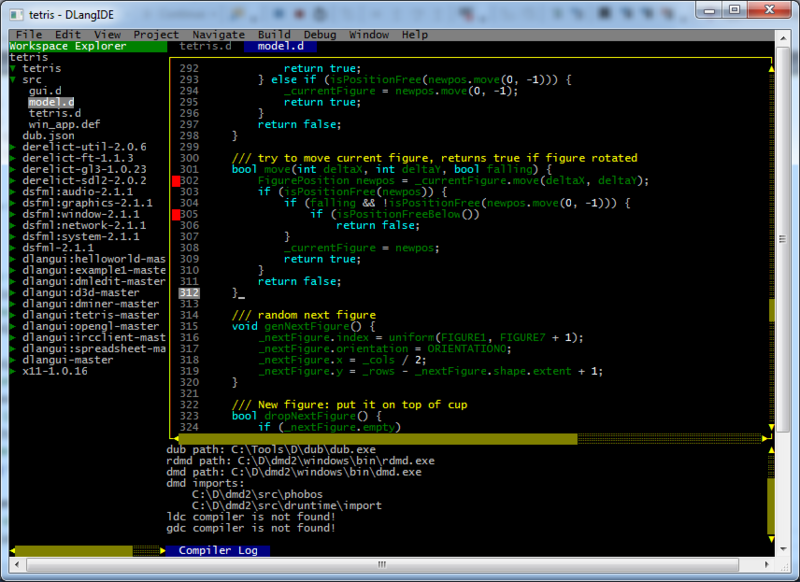 You can use DUB utility and DMD compiler to download, build and run recent version of DlangIDE from GIT repository. Pre-requisites: install DMD from https://dlang.org/download.html. In recent DMD packages, DUB utility is included. On OSX you will need to install libSDL2, which is used as a default backend. E.g. use homebrew or some other package manager to install it. For troubleshooting of screen DPI detection (e.g. if everything is small on Retina display), you can choose DPI manually in menu Edit / Preferences / Interface : Override screen DPI. (This issue will be fixed soon). On Linux will need to install libSDL2, which is used as a default backend. If it's not yet installed, install it in order to run DlangIDE. Pre-built win32 binaries can be found in releases section. As well, you can build it yourself. Recent builds with dmd under windows have issues with crash in OPTILINK linker from DMD. Note: unlike default --arch=x86, both x86mscoff and x8664 have a dependency on linker from Visual Studio C++ compiler toolchain. DlangIDE uses DUB as build tool, and its dub.json or dub.sdl as project file format. You can select DMD, LDC or GDC compiler toolchain. Symbol lookup and autocompletion is using DCD (D completion daemon). Hans-Albert Maritz (Freakazo) implementated DCD integration using DCD client/server. Keywan Ghadami improved it to use DCD as a library. Now DCD is embedded into DlangIDE, and no separate executables are needed. DlangIDE supports only DUB project format. To import existing DUB project, use menu item "File" / "Open project or workspace" and select dub.json or dub.sdl of your project to import. Needs DMD 2.066.1 or newer to build. HINT: Try to open sample project Tetris, from workspaces/tetris with DlangIDE. To develop in VisualD together with DlangUI, put this project on the same level as dlangui repository, and its dependencies. Keyboard shortcuts settings support is added. If no such file exists, it's being created on DlangIDE start, filling with default values to simplify configuration. Just edit its content to redefine some key bindings. 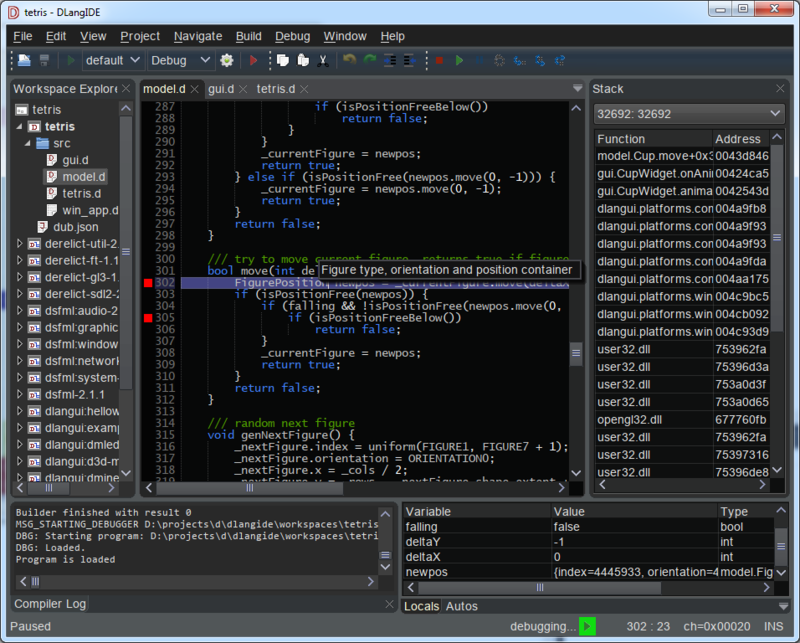 For Linux and OSX, install MonoDevelop + Mono-D plugin. For Linux / OSX, additionally install libSDL2 and X11 development packages. Choose dlangide as startup project.